One day, Erlend came home with over 2 pounds of cherries from our neighborhood farmer's market. "They were on sale — last of the season!" he had exclaimed when I looked at them skeptically. "Don't worry, I'll eat them all!" Sure enough, 2 days later and halfway through the bag, he pushed the rest of the cherries towards me. "I can't stand them anymore. Use them for baking." Truth be told, I've never been the world's biggest fan of cherries. I've hated maraschino cherries for as long as I can remember, and although I like the taste of regular cherries, I find them to be too much work — that is, too much pit and too little fruit, especially when it came to using them in baked goods. Only less than a week ago, my friend Noah and I had made a cherry pie, half of which we spent taking turns with a cherry pitter to stamp out the pits one by one. And when I started researching recipes that used cherries as their primary star, all search results sent me to clafoutis recipes. Isn't clafoutis a funny word? 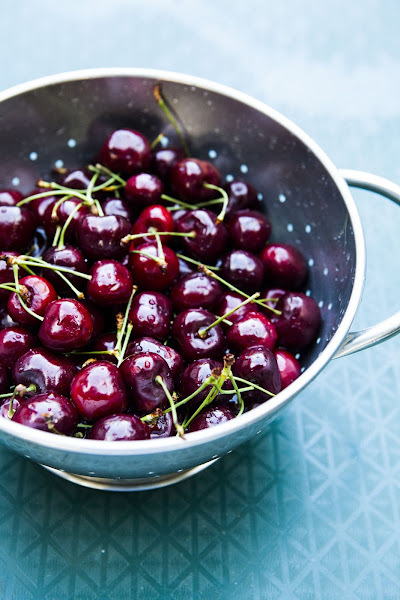 It's one of those desserts that I'd always heard of, but had no idea what it actually was (or how to pronounce it — CLAH-foo-tee, apparently) until I started researching cherry recipes. 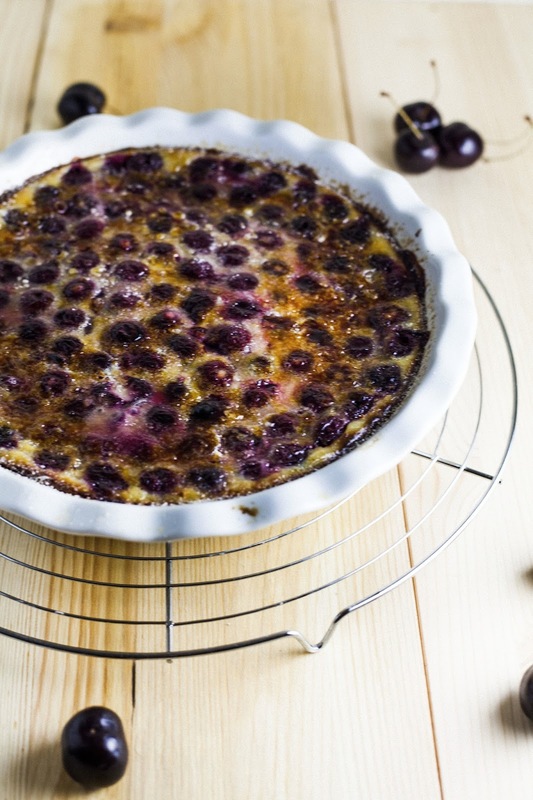 It turns out that a clafoutis is a French baked custard, traditionally made with unpitted cherries. 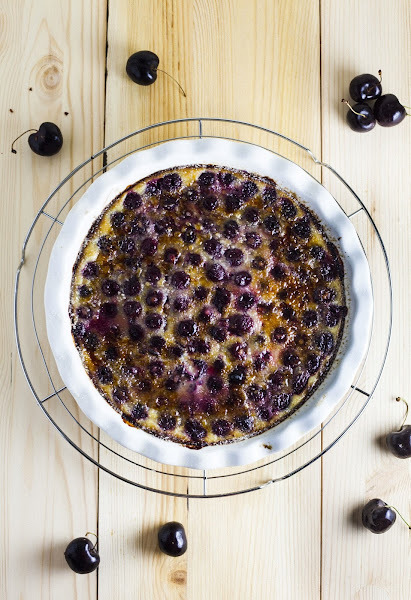 The cherries float to the top of the clafoutis's light, liqudy batter, which then transforms into a flan-like custard during the baking process. Traditionally served warm from the oven, it made me realize what a shame it was that cherries weren't ripe in the winter — it was wonderfully rustic and satisfying dessert, perfect for rainy days and cold nights. Traditional clafoutis recipes use unpitted black cherries, with the theory being that the pits in the cherries give the custard a faintly almond flavor. I didn't want my clafoutis's custard texture to be ruined by cherry pits, so I went ahead and pitted the cherries anyway. I also used sour pie cherries, because these were the cherries that I had on hand. 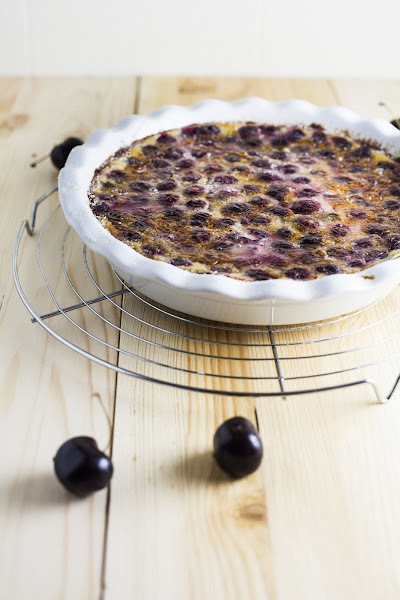 Despite not having a truly authentic clafoutis, the sour cherries were inadvertently a great choice as the fruit's tart flavor and acidity was the perfect balance to the custard's sweetness. And finally, the last liberty I took was using my chef's torch to create a sugar brûlée layer on top of the clafoutis, resulting in a dessert that tasted like a giant, fresh baked crème brûlée — with cherries on top. Mmm. This is definitely a dessert I'll be making again next time cherry season rolls around. I used a miniature chef's torch to brûlée my clafoutis's sugar topping (you can see what the unbrûléed clafoutis looks like on my Instagram). If you don't have a chef's torch, have no fear — you can still get the same results! Immediately after the clafoutis is done baking, sprinkle the top with 1/4 cup granulated sugar and place the clafoutis directly underneath your broiler. The sugar will quickly caramelize and give you the same brûléed effect — just watch it carefully as it will darken quickly! This recipe calls for one vanilla bean pod, which admittedly is expensive and can be hard to find. Feel free to substitute with 1 teaspoon vanilla extract. Not a fan of cherries? You can use any fruit that is well balanced with acidity and sweetness — I'm thinking about doing a version with raspberries, apricots, and/or peaches. Preheat the oven to 425 (F). Liberally butter a 10-inch ceramic quiche mold or pie dish. In a medium saucepan, combine 2 cups whole milk, 3/4 cup granulated sugar, and a pinch of kosher salt. Score your vanilla bean pod lengthwise and scrape the vanilla beans from inside the pod into the milk and sugar mixture, before adding the vanilla bean pod to the mixture as well. Place the pan over medium heat and heat to just under a boil, stirring occasionally to dissolve the sugar. While the milk mixture is heating, break 1 egg into a heatproof mixing bowl. Add 1/3 cup plus 1 tablespoon flour and whisk until the mixture is free of any lumps. Add the remaining 2 eggs and whisk until smooth. When the milk mixture is ready, remove the saucepan from heat and use a fine-mesh sieve to strain the milk mixture into a large liquid measuring cup — discard the vanilla bean pod at this point, as the vanilla beans will have been incorporated into the milk mixture during the cooking process. While whisking constantly, slowly pour the hot milk mixture into the egg mixture. Pour the mixture into the prepared mold and add 2 cups pie cherries, making sure that the fruit is evenly distributed throughout the pan. Bake for 30 to 35 minutes, or until the clafoutis is just set in the center and slightly puffed and browned around the outside. Once the clafoutis has finished baking, transfer to a wire rack and let rest for 10 minutes. Once the clafoutis has rested for 10 minutes, sprinkle the remaining 1/4 cup of granulated sugar over the top of the clafoutis, making sure to create a thin, even layer of granulated sugar over the flan. Use a chef's torch to brûlée the sugar, making sure to stop the flame once you see the sugar turning into a golden-brown color — the sugar will continue to brûlée for a few more seconds even after the flame stops. Serve immediately; the clafoutis is best warmed or at room temperature.